Speaking poetically, bending on the harmonica is the wailing, moaning voice of the blues. Speaking technically, bending is a downward change in pitch. It’s an effect produced by the interaction of the blow and draw reeds together, and it’s regulated by your tongue position. Winslow Yerxa coined the term “the K Spot” in his book “Harmonica for Dummies.” The K spot is the part of your tongue you use to make a “K” sound. Say “K” a couple of times to find it. You form a “K-Spot” by raising that part of your tongue to the roof of your mouth, and restricting the airflow slightly. For draw bends (holes 1-6), the K spot pulls backwards, creating a larger chamber inside your mouth between the harp and your tongue. For blow bends (holes 7-10), that K spot pushes forward, creating a smaller chamber between harp and tongue. What we’re really doing is tuning your mouth to the note you want to resonate on your harmonica. Experiment with draw bends on holes 1-6, and be sure always to maintain CLEAR SINGLE NOTES. On hole #1 draw, you may have to open your jaw slightly as you bend. Experiment with blow bends on holes 7-10. You may have more luck using a lower pitched harp for blow bends, like an A or a G.
You don’t have to play hard to bend. Breath support is important, but mouth position trumps it. Your mouth will feel a change in vibration when a note bends: try to pursue that feeling while remaining relaxed. It’s not the harp, it’s you. Just hang in there. Lots of folks have trouble playing 2 and 3 draw clearly, with or without bending. Go easy, use gentle breath, and make sure to maintain your single-note pucker and align properly on the hole you’re aiming for. Do you hear a change in pitch? You may hear a change in timbre before you actually get a pitch change. Bent notes often sound a little pinched. If you hear any change, you’re on the right track. Bending may come easily to you, but more likely it will take persistent experimentation. This can become frustrating! If you’re able to, try giving yourself a pass: you’re allowed to take as much time as you need to learn this. You may find that accepting the process will cause you to relax and learn to bend faster! 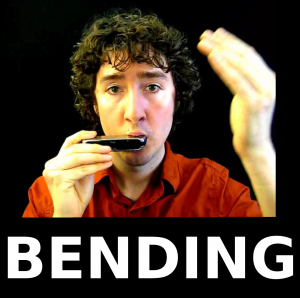 I’m playing a C harmonica for these bending examples. Remember, holes 5 and 7 don’t have much wiggle room, so go easy on them. Next Next post: Why Study Music Theory?